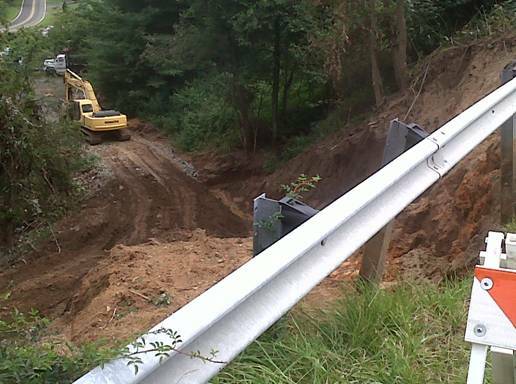 NCDOT now estimates that N.C. 163 near Glendale Springs could be opened by the end of September. The road was closed in early August to repair a slope next to the highway damaged due to storms. According to NCDOT the closure had to be extended as crews worked to stabilize the top of the slope to make it safe to work below. That meant shooting soil nails and shotcrete (high pressured concrete) to keep the top from falling below. Large rocks have also been brought in to rebuild the slope. If everything continues on track (weather permitting of course), the road could be opened by the end of September. · Take N.C. 163 and turn right onto U.S. 221. Turn right onto N.C. 16 and head back to N.C. 163. I loaded around 500 ton of shot rock today, about another 6-7 days like that and the hole will be good.